This tutorial is designed for researchers, practitioners, program staff from federal agencies and graduate students interested to use advanced data mining algorithms and visualizations in their work to map the structure and dynamics of science. 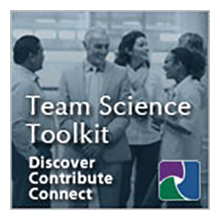 They will use the Science of Science (Sci2) Tool (http://sci2.cns.iu.edu) to run temporal, geospatial, topical, and network analysis and visualization workflows designed to increase our understanding of science and technology developments. The first hour of the tutorial provides a basic introduction of the tool. Remaining time will be spent discussing sample workflows featured in the Sci2 Tutorial at (http://sci2.wiki.cns.iu.edu) and new functionality such as the Twitter and Flickr readers, the Yahoo! geocoder, networks overlaid on geospatial maps, network clustering and backbone identification algorithms, and the analysis and visualization of evolving networks. Katy Börner is the Victor H. Yngve Professor of Information Science at the School of Library and Information Science, Adjunct Professor at the School of Informatics and Computing and the Department of Statistics in the College of Arts and Sciences, Core Faculty of Cognitive Science, Research Affiliate of the Biocomplexity Institute, Fellow of the Center for Research on Learning and Technology, Member of the Advanced Visualization Laboratory, and Founding Director of the Cyberinfrastructure for Network Science Center (http://cns.slis.indiana.edu) at Indiana University. She is a curator of the Places & Spaces: Mapping Science exhibit (http://scimaps.org). Her research focuses on the development of data analysis and visualization techniques for information access, understanding, and management. She is particularly interested in the study of the structure and evolution of scientific disciplines; the analysis and visualization of online activity; and the development of cyberinfrastructures for large scale scientific collaboration and computation. She is the co-editor of the Springer book on ‘Visual Interfaces to Digital Libraries’ and of a special issue of PNAS on ‘Mapping Knowledge Domains’ (2004). Her new book ‘Atlas of Science: Guiding the Navigation and Management of Scholarly Knowledge’ published by MIT Press will become available in 2010. She holds a MS in Electrical Engineering from the University of Technology in Leipzig, 1991 and a Ph.D. in Computer Science from the University of Kaiserslautern, 1997.